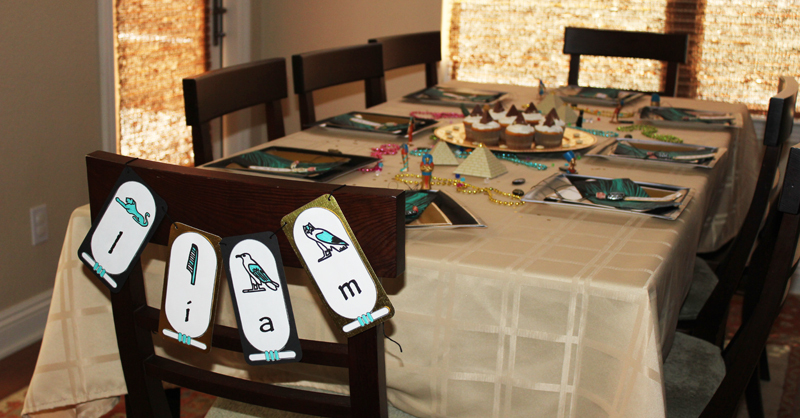 My son is fascinated with all things Egypt so when he told me that he wanted an Egyptian themed birthday party I was at once freaked out and very excited. You see, I am also an Egypt fanatic and I was lucky enough to be able to visit Egypt over 15 years ago. I still can’t get enough of the beauty and mystery. So why was I freaked out exactly? 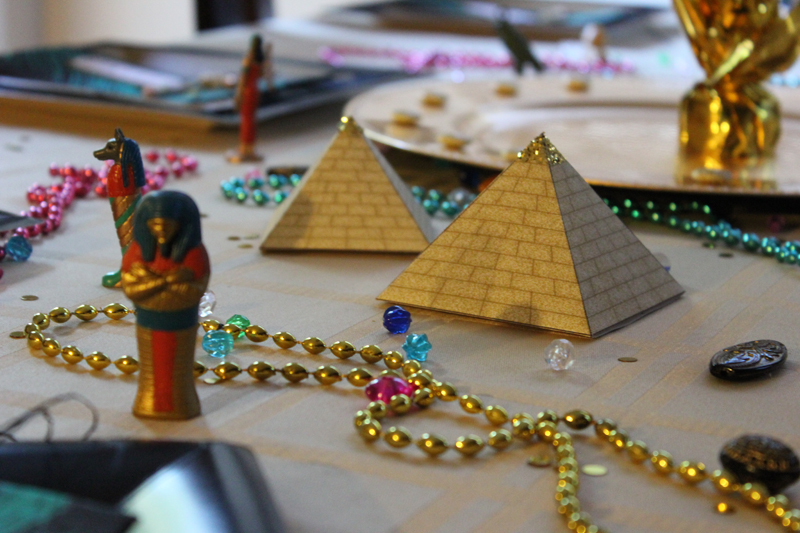 Well, as you can imagine, there is very little in the way of prefab Egyptian theme birthday party supplies, so I knew it would be a lot of work on my part. 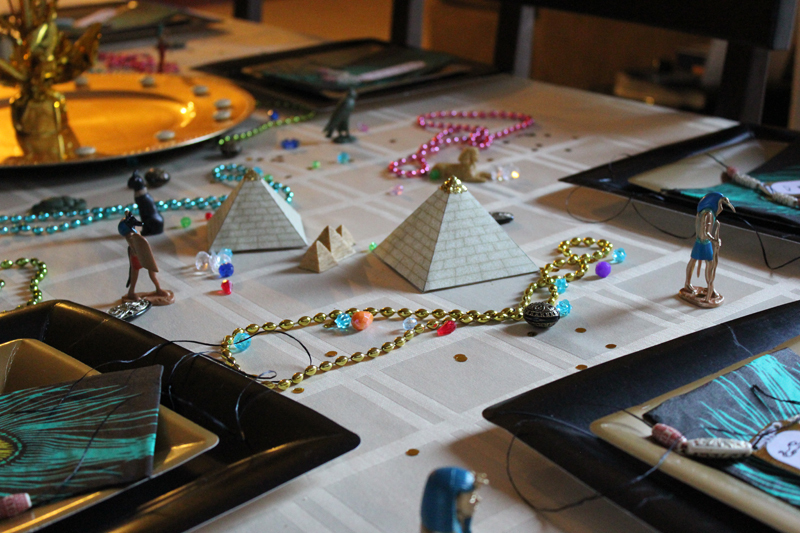 But thanks to the internet (and to Pinterest specifically) I was able to put together a fabulous Egyptian party that any little boy or girl would love. 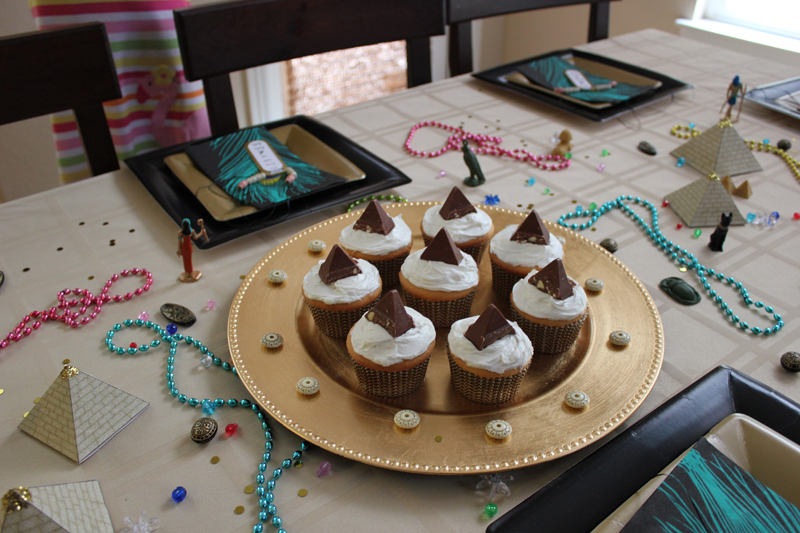 Mini pyramid template printed (in two different sizes) and topped with glitter from Don’t Eat the Paste. Mini Egyptian figurines (Safari LTD Ancient Egypt Toob) found online or at Micheal’s. Beaded necklaces, black & gold plates, peacock napkins and gold tray from Party City. 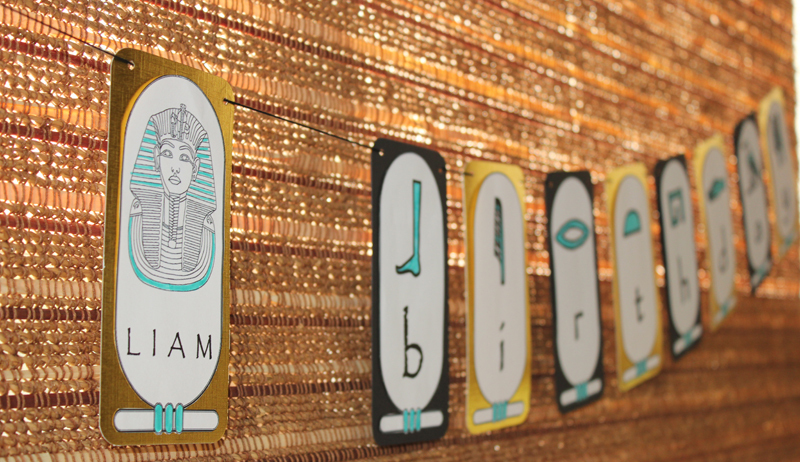 I made mini cartouche necklaces with each childs name using this Egyptian cartouche template, beads from Lakeshore Learning that I already had from when the kids were in preschool. I used gold paper from Micheal’s and mounted the name cartouches to give it a little glitz. I found an Eye of Horus image online and modified it in photoshop, printed and mounted with toothpick taped to the back. 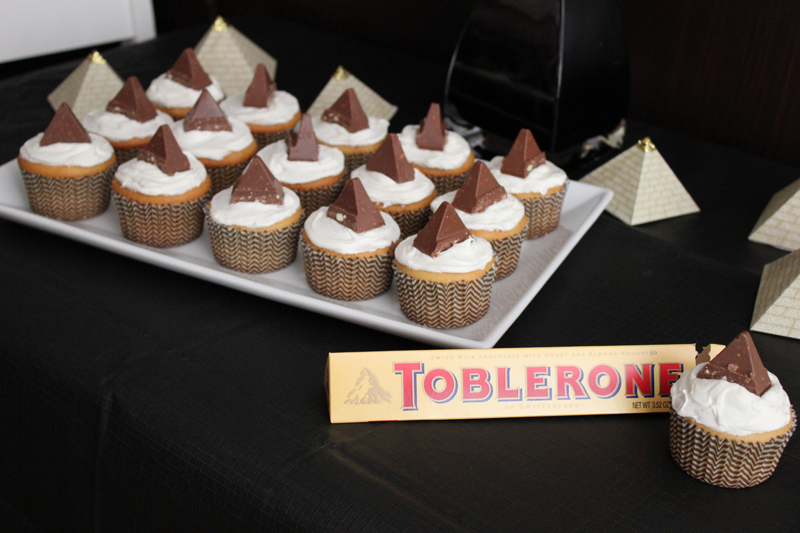 Toblerone cupcake toppers! 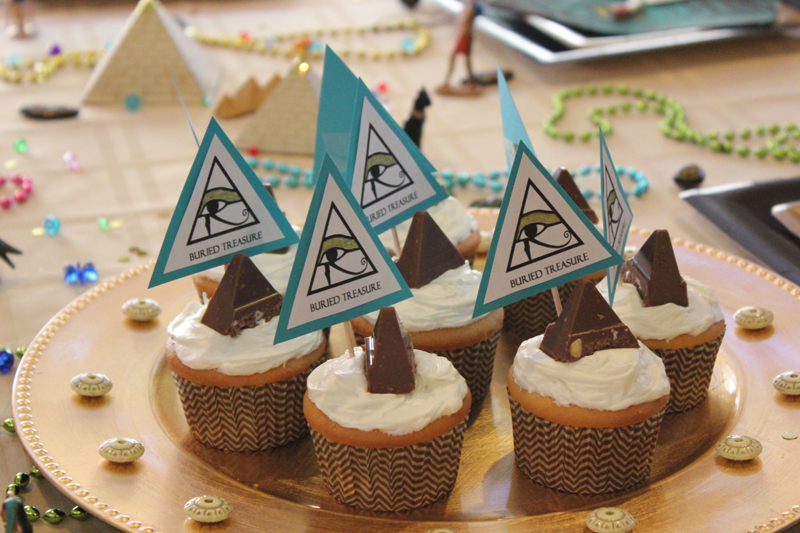 Perfect pyramids and super yummy! Each cupcake had a buried treasure! Birthday boy had a gold dollar coin hidden in his cupcake. I washed and then wrapped each coin in a little bit of wax paper. I slit a hole in each cupcake and slipped in the coins. Once frosted, no one was the wiser! So fun! 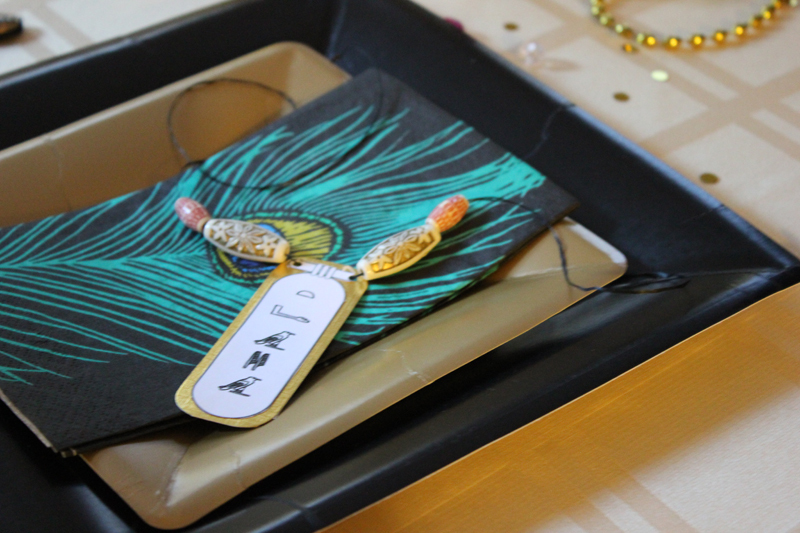 I used this awesome cartouche template and printed hieroglyphs using this Ancient Egyptian Font from dafont for the banners, cartouche necklaces, goodie bag labels and for the contents of the goodie bag (see below). Luckily, my mother had this old 2004 Egyptian calendar that she gave me. I used part of the calendar pages to make these banners and the remaining scraps to decorate the front of the goodie bags. And of course, black and gold balloons. Each child had their own bag with their name spelled in hieroglyphs. I used the remaining scraps from the calendar (mentioned above) to back the cartouches. Each goodie bag had two gold pouches, one filled with Rollos & cookies & cream Kisses and the other filled with ethnic beads. 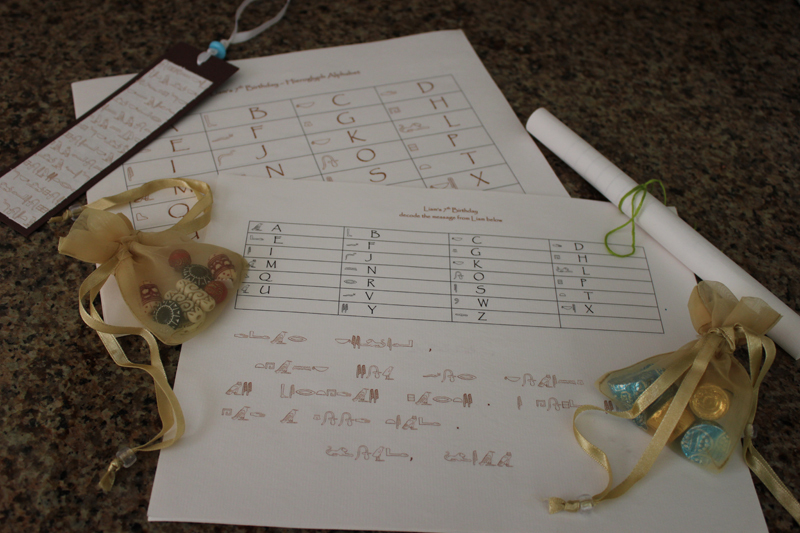 My son and I created a message for each child to decode and I made hieroglyph bookmarks. 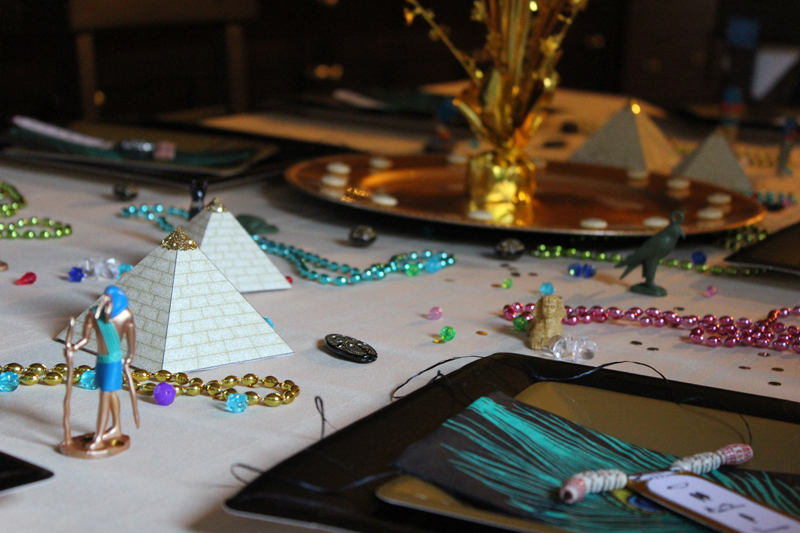 I hope this post gives you some good ideas for when your little one asks for an Egyptian theme birthday. It sure was a lot of fun to put together. PS: A little geeky, I know, but I also had “Engineering An Empire – Ancient Egypt” playing on the big screen TV for background ambiance. LOL.